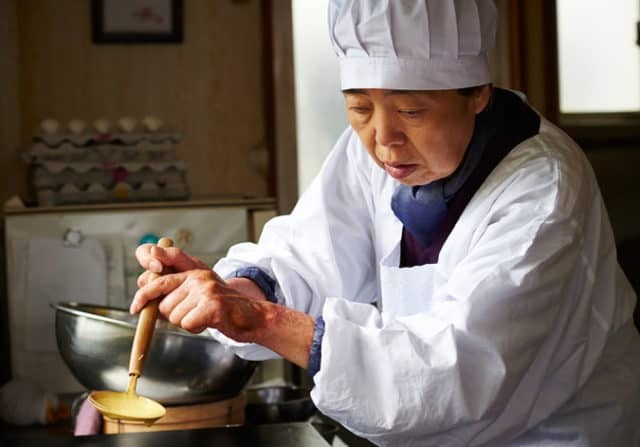 Sweet Bean (2015), directed by Naomi Kawase, is one of the most aesthetically pleasing films I’ve seen in the past few years. It’s a slow stroll through cherry blossom season, with each character and storyline finding their own rhythm and pace. Sentaro (Masatoshi Nagase) opens the movie with a slow, lumbering gait. He practically drags the viewer into work with him. Tokue (Kirin Kirie) hobbles into Sentaro’s pancake shack (more on this later) in a somewhat starstruck manner. She marvels at the trees, the wind, the possibility of working for Sentaro, and the viewer is easily pulled alongside her for the rest of the film. Wakana (Kyara Uchida) is a young teenager who visits the dorayaki shop Sentaro runs and gently brings all of the characters together.